^ Centar domovinskog rata - 1995. ^ "Martic Witness Details Croatian War Casualties". Global Voices BALKANS. Retrieved April 13, 2006. ^ Marko Attila Hoare (April 2008). "Genocide in Bosnia and the failure of international justice" (PDF) （2011年7月18日時点のアーカイブ）. Kingston University. Retrieved March 23, 2011. ^ a b Zanotti, Laura (2011). "Governing Disorder: UN Peace Operations, International Security, and Democratization in the Post-Cold War Era". Penn State Press. ISBN 978-0-271-03761-5. ^ "Srpske žrtve rata i poraća na području Hrvatske i bivše RSK 1990. – 1998. godine". Veritas. Retrieved June 16, 2015. ^ Meštrović, Stjepan Gabriel (1996). 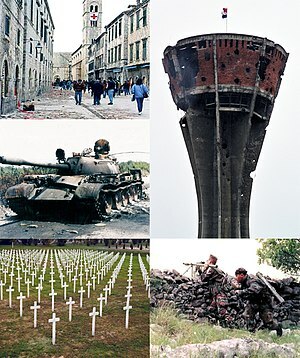 "Genocide After Emotion: The Postemotional Balkan War. Routledge." ISBN 0-415-12294-5.